Tuskegee University in Tuskegee, Alabama, is a historically Black university with a long tradition of educating African American scholars. Clayton Yates, Ph.D., is continuing that tradition as co-director of the Research Centers in Minority Institutions (RCMI) program at Tuskegee. Temesgen Samuel, D.V.M., Ph.D., is his co-director. The Tuskegee RCMI program has a particular focus on prostate cancer, with ongoing projects exploring how genetic differences contribute to how aggressive tumors are, especially between people of African and European ancestry. The RCMI program also funds smaller projects focused on diabetes, machine learning, and getting the word out about health disparities, as well as projects on cervical and breast cancer. 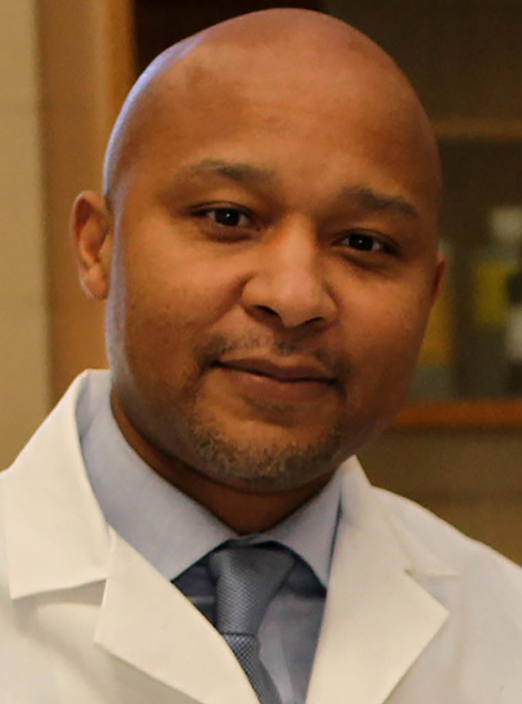 We spoke with Dr. Yates about the RCMI program, his own research, and what it means to work at an institution with such a strong history of science by African Americans. What is the focus of the RCMI program at Tuskegee? Our Center for Biomedical Research has a long history. As an RCMI program, our focus is to provide the equipment and resources for our investigators to be able to compete at a national level. With that support, we’ve been able to build research capacity and focus on the populations that we serve in this area, which are predominately African American and rural. Tuskegee is in the Black Belt region, which stretches across 13 states in the South and has some of the highest rates in the country of cardiovascular disease, diabetes, and cancer. Tuskegee University also serves a student population that is over 99% minority. We’re training the next generation of scientists through innovation, research, teaching, and mentorship. You mentioned working with the local community. What kind of work does the Tuskegee RCMI program do with local residents? Our Community Engagement Core is an exciting part of the RCMI. It’s led by Dr. Lonnie Hannon. His job is to empower the community. He’s asking them to say what they need and directing them toward resources to accomplish those goals. We’re really excited about how the community has embraced us. He recently published an article about that work. We hold community forums, where a project leader will talk about their research. It’s a small town and a small community, and we’re showing everyone that we’re not just here on campus doing this research. We’re doing this for you. We stream the forums live on social media, and we’ve had multiple forums where we have over 1,000 participants. The RCMI grant also pays for community health educators who are out in the community educating people about HIV prevention, cancer, and other health topics that are important to them. We’re also partnering with the translational science center at the University of Alabama at Birmingham (UAB) Center for Clinical and Translational Science. We don’t run any clinical trials, but they do. Because of our work in the community, if people are approached by a physician-scientist from UAB who’s running a clinical trial, they know what that entails. That’s part of their empowerment. Speaking of clinical research, many people associate Tuskegee University with the Tuskegee Study, in which the U.S. Public Health Service withheld treatment from poor African American men with syphilis. What does that mean to you, as a researcher at Tuskegee now? Yes, nationwide, that is the predominant association. Because of that difficult history, and how the university has reckoned with it, we are trusted. When other organizations in the African American community hear that Tuskegee is involved, they will listen. Because of the history and because of the focus on bioethics here, the institution has attracted academics who are sensitive to those issues, care about ethics, and give it careful thought. We are also home to the National Center for Bioethics in Research and Health Care. What is your own research on, and how did you come to work at Tuskegee? I grew up in Atlanta, but I was actually born here on Tuskegee’s campus and I graduated from here as an undergraduate. After college, I did my training at the University of Pittsburgh, then Emory University, and I came back here as a faculty member. My grandfather passed away from prostate cancer when I was 14 years old, and I’ve dedicated my life to that. Over the years, my lab has developed multiple tools to study the pathways that lead to prostate cancer. We’re currently working with a prostate cancer research consortium to look for genes that are more aggressive in people of African ancestry. My focus on prostate cancer disparities has extended to breast cancer disparities. We recently published an article on a new breast cancer subtype. This subtype is more common and more aggressive in African American women. Our findings suggest that women who have these tumors would benefit from immunotherapy instead of traditional chemotherapy. What are some of the disparities for breast and prostate cancer? An African American man is 60% more likely to be diagnosed with and twice as likely to die of prostate cancer than any other race. Traditionally, breast cancer incidence was higher in Caucasian women, although African American women have recently caught up. But African American women have always been twice as likely to die from the disease. People didn’t use to think there were genetic or molecular disparities, and there was no funding to study them. The overall consensus was that this was due to the socioeconomic status of minorities—that they have less access to quality health care. However, I knew there was a biological component contributing to this disparity, because we could see it in those alarming statistics. They had to come from somewhere. Now that more people are doing this kind of research, new funding opportunities have been developed, and now we are starting to see that the disparities are multifaceted: It’s biological. It’s social. It’s access to health care. It’s economics. Tuskegee University was founded by Booker T. Washington, and it was the institution where George Washington Carver worked. What is it like to work at a place with that kind of history? When I finished my training, there was no other place that I wanted to go. I always knew I wanted to do disparities work, and I wanted to do it on this campus. I wanted to do meaningful work and to work with other minority scientists; to be able to pay it forward. I’m very, very, very thankful to be able to come here every day and do the type of work that we do. Every day when I come to work and walk into the George Washington Carver Research Building, I’m reminded of the discoveries that people made before me. I take it very seriously and to heart. And it drives me more and more to keep pushing forward. We’re also making new history, by making new discoveries and adding to the legacy and the history that came before us. Read more about NIMHD’s RCMI program.